Could Amir Khan be closer than ever to a fight with Manny Pacquiao? Some more news from today’s press conference to announce Amir Khan’s September 8 fight with Samuel Vargas. 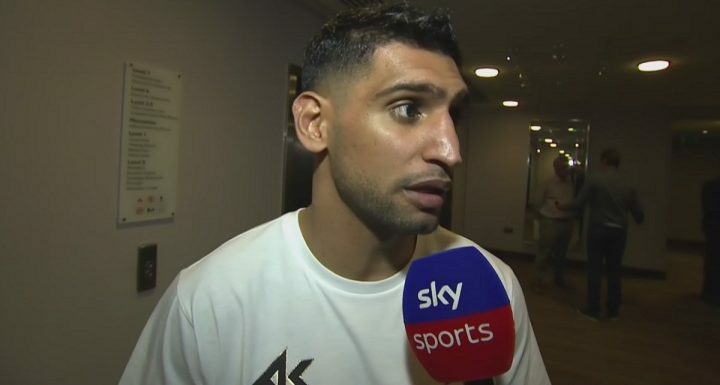 Khan, again speaking with Sky Sports, said there is a very good chance the fight between he and Vargas will be a final eliminator for the WBA ‘regular’ title at welterweight, a title current holder Lucas Matthysse is set to defend against superstar Manny Pacquiao in July in Kuala Lumper. Khan says that should he win the Vargas fight (and of course the former 140 pound champ is sure he will in fact do so, he says in style) he will then fight the Matthysse-Pacquiao winner. Now, a lot of things need to fall into place for it to actually happen – chiefly, the ageing Pac Man has to beat the slightly less-aged Matthysse – but it just might be that Khan is closer than anyone could have possibly thought, a couple of months back if not even more recently, to a super-fight with Pacquiao. For years, Khan tried his best to secure a mega-fight with either Floyd Mayweather or his former spar-mate and gym-mate Manny. Khan appeared to get close to both fights, but in the end the British star was denied his big opportunity – he says unfairly (Mayweather launched an online poll back before his first fight with Marcos Maidana, asking fans to vote for his next foe; Khan picked up the most votes yet Floyd opted for “El Chino” anyway). But now, might Khan get his big chance against former pound-for-pound king Pacquiao? We don’t know how much longer Pacquiao aims to fight on for (and likely neither does he) and again, we don’t know for sure that the 39 year old (40 in December) will beat the Argentine banger. We also have no idea if, at this stage of his career, Pacquiao would have ANY interest in facing the still-fast (with his hands especially) Khan. But Khan is hoping. The former champ is also plotting. Does Khan, after all he’s been through in his career – the setbacks, the willingness to always fight the best, being so close to a super-fight with Mayweather and one with Pacquiao – deserve a shot at Pac Man all this time later? Would you still have interest in seeing this fight? Khan has other options, including a ‘this-fight-won’t-go-away’ Kell Brook clash, but you can bet your bottom dollar, if Khan got a shot at Pacquiao he’d drop any plans to face Brook like a bad habit. You are here: Home / Boxing News / Could Amir Khan be closer than ever to a fight with Manny Pacquiao?